Imported as a separate, additional CSV file, proposal data is a key piece of information for Gift Officers. Quickly search and filter on your proposals, or drill into a specific proposal to write an interaction to track your progress! Your proposals are rolled up into an easy to use table, which can be accessed by clicking the Proposals tab at the top of the "Browse" section. 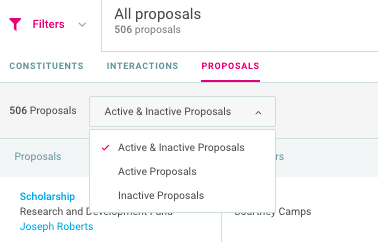 Once in Proposals, you can quickly sort proposals into active and/or inactive through the drop down above the proposals table (if applicable). This table will display your institutions imported proposal data. All columns can be sorted in either ascending or descending order, excluding the Proposals and Solicitors columns. Click on the Proposal name to drill into that specific proposal. In addition to the Proposals table, there are 5 Proposals filters that can be used: Proposal Ask Amount, Proposal Ask Date, Proposal Status, Proposal Solicitors, and Has Active Proposal (yes/no). 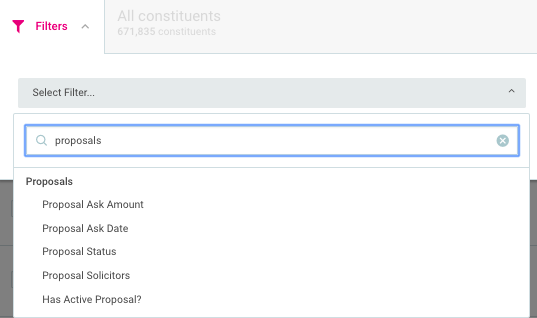 Use these filters to narrow down constituents, interactions, or proposals related to that data. Quickly track progress on a proposal by entering interactions directly on a proposal. To enter an interaction, click the Add Interaction button or use the Actions dropdown menu. All interactions written on a proposal will be displayed in the "Associated Interactions" section. By entering an interaction directly on a proposal, the proposal ID is connected to that interaction, which allows you to easily get this information back into your database. These interactions will also display on the constituent profile, under Interactions. Ready to import a proposals file? Click here is the field guide.